Back at it again with their stellar lobster and crab offerings is Ginger at PARKROYAL on Beach Road. Helmed by our friend and the maestro behind their innovative seafood-centric spread is Resident Executive Chef Low Hoe Kiat. This season, ‘A Clawsome Seafood on Grill’ showcases an incredible spread of crustacean delights with a touch of local influences, and BBQ seafood will be added to the repertoire; think of it like dining in a sea of oceanic gems enjoying a decadent amount of premium seafood and local favourites – at an unbelievable price. Diners looking for a hearty indulgence will be thrilled by the new Lobster and Seafood Shanghai Noodle Soup, with its robust seafood broth, topped with oceanic gems such as lobster, crab claw and scallops as well as our personal favourite, Chef Low’s piquant Braised Crab Bee Hoon that teases any palate with its aromatic wok-hei flavour. With so many exciting lobster and crab dishes to look forward to, you’ll be insane to give this a miss. And as if this stunning buffet could not get any more enticing, our readers can quote ‘ladyironchef’ to enjoy 25% off for both the lunch and dinner buffet from 01 April to 30 June 2018. 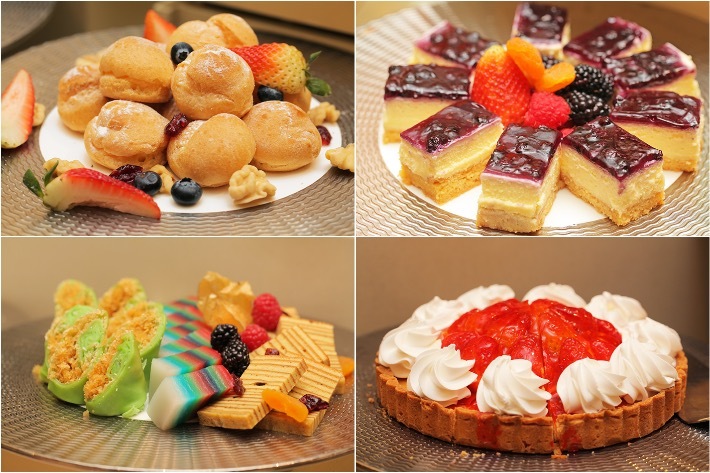 That means you only pay S$51++ per adult for both the Weekend lunch and Daily dinner buffets! 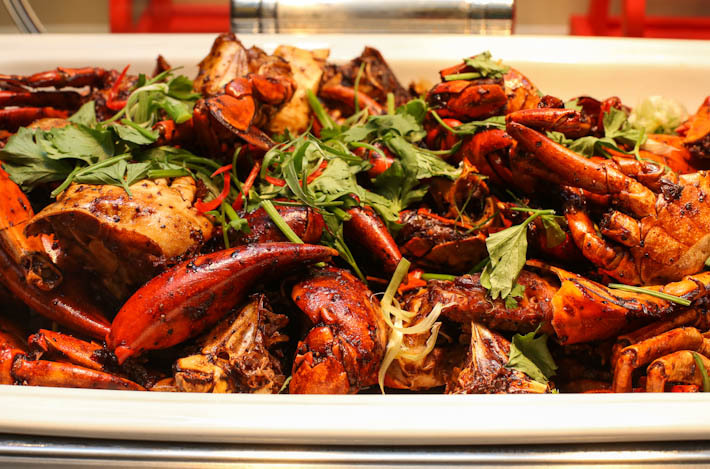 Those who are familiar with Ginger’s Lobsters & Crabs buffet would recognise Executive Chef Low’s winning recipe that won countless praises from the public. This phenomenal dish beautifully combines the succulent texture of lobsters with generous servings of pumpkin puree that has been infused with locally sourced herbs. The consistently good pumpkin gravy is the key to its huge success and we absolutely adore the creamy, smoky taste that just further accentuates the natural sweetness of the lobster. 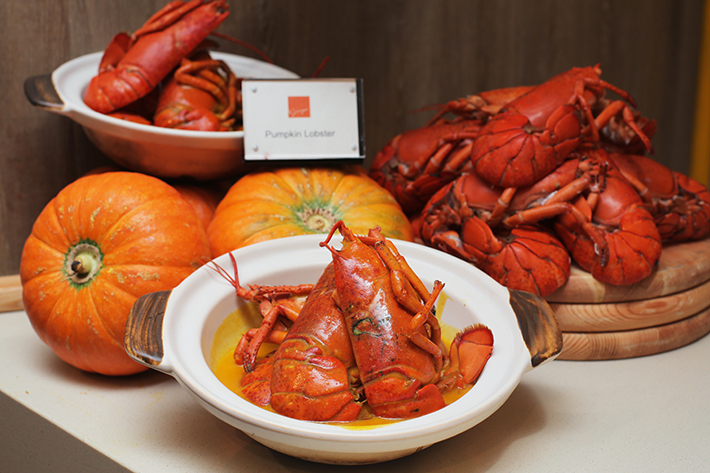 Diners can get their serving of Pumpkin Lobster in Claypot at the live counter where, upon request, the chefs will whip up a fresh pot right before your eyes. 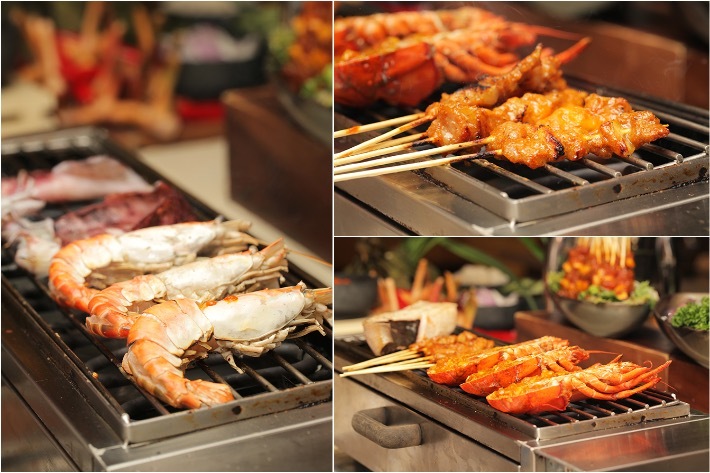 If you get excited by the sizzling sounds and smoky aromas that emerge as a result of freshly grilled seafood then you will be delighted by Ginger’s array of seafood offerings at its Barbecue Live Station. Choose from a plethora of fresh seafood beginning with stingray, prawn, squid and shellfish such as clams and mussels, as well as lobsters and watch as these ocean gems are cooked à la minute on the open grill right before your eyes. Don’t forget to slather a generous helping of Ginger’s house-made sauces and sambals that are all concocted using onions, chilli, limes, salted fish, providing a spicy and umami-packed kick to the barbecue delights. It is truly like indulging in BBQ seafood at your favourite hawker centres, except that you are in a much more comfortable environment with airconditioning sans smoke-filled air. 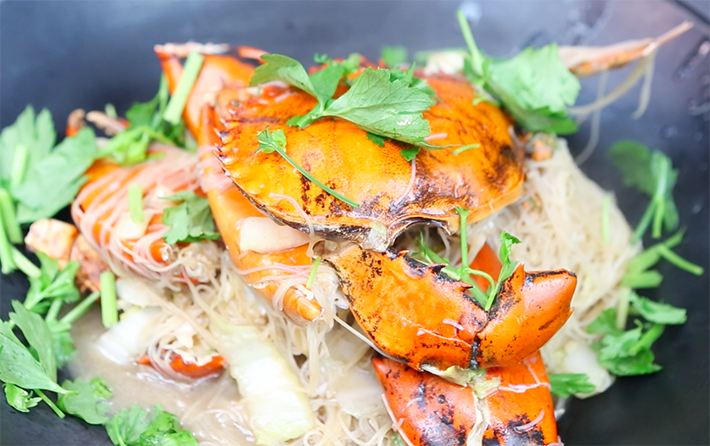 Swimming in a subtly sweet, savoury and spicy gravy, the much-loved Chilli Crabs is a staple and we particularly love Chef Low’s rendition as it is served with lots of egg stirred into the sauce mixture to give it a luscious and decadent texture. 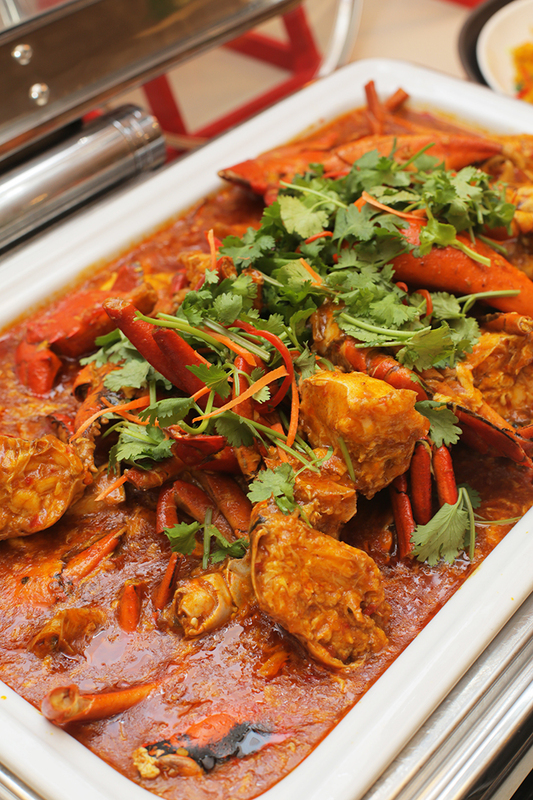 Spicy but not overly heavy on tomato, the chilli crabs served here at Ginger boasts a savoury aroma and allows diners to truly appreciate the natural sweetness of the crab. Reminiscent of toasted pepper corns, the Black Pepper Crab is a showstopper in its own right and is something that diners can look forward to. Spicy with a prominent peppery flavour that lingers on the tongue, coupled with the sweet flesh of the crab, makes for one solid mouthful that we just cannot get enough of each time we visit. 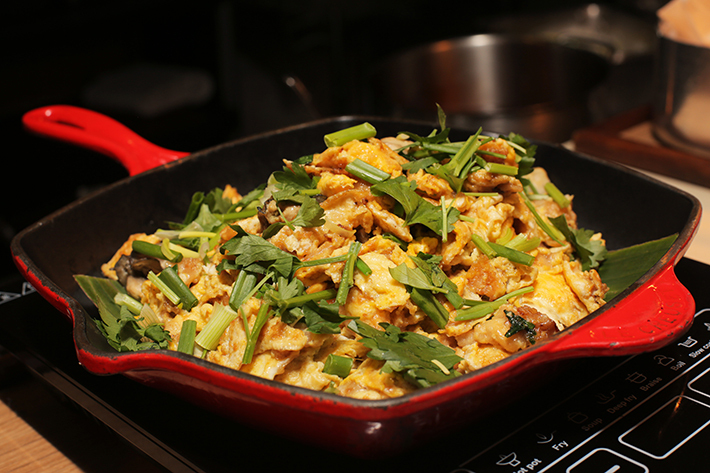 One of Chef Low’s signatures and a crowd favourite is the Braised Crab Bee Hoon. Brimming with an unbelievably aromatic wok-hei flavour, this noodle dish uses a flavourful stock infused with crab; the bee hoon is hence allowed to simmer and soak up all the goodness. Cooking it over a roaring flame also allows each individual strand of bee hoon to achieve a prominent wok-hei flavour. Crispy around the edges yet maintaining a fluffy centre, we dare admit that the Oyster Omelette served here is one of the best we’ve had. Served with plump oysters, each bite promises a symphony of oceany, briny flavours mixed with fried eggy goodness. 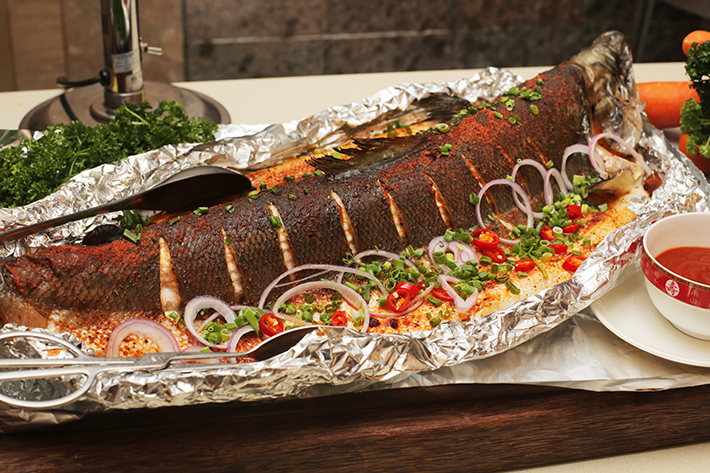 Served whole over a bed of red onions, chillies and spring onions, this colossal baked fish is baked with fresh aromatics and chillies. The humble salmon is given a lick of local Southeast Asian flavours that are all nicely blanketed in a subtly toasted flavour. Pair it with their house-made chilli sauce! 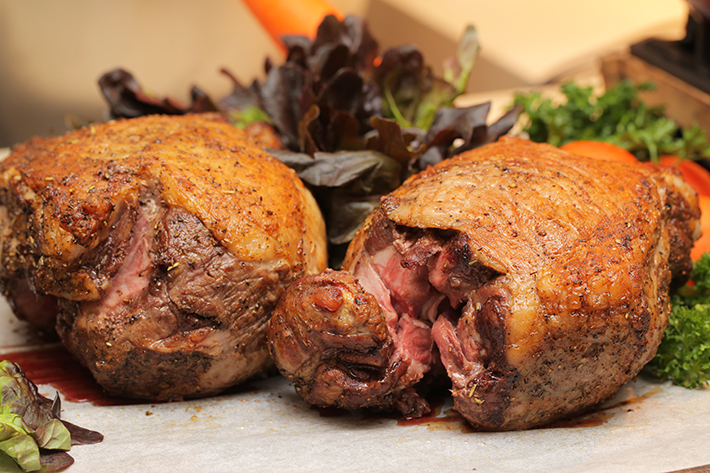 To satisfy your craving for red meat, be sure to tuck into their Roast Lamb. Roasted low and slow to achieve a deep crust, the pleasantly gamey lamb still retains a pinkish medium-rare hue in the middle that is both tender and flavourful. To complement the robust and gamey qualities of the lamb, spoon over some of their house-made mint sauce. 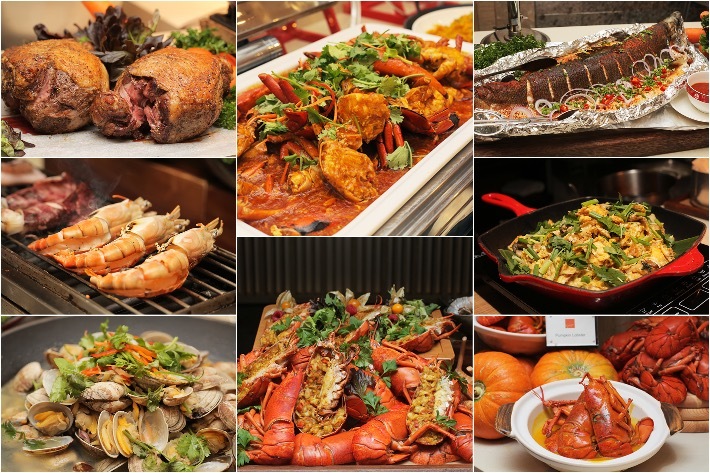 Crustaceans aside, the buffet spread also encompasses a wide range of locally-inspired dishes, as well as, tastes from around the region. We particularly love their Braised Pork Belly and Intestines that go marvellously well with either their plain or chicken porridge. Although not the most extensive of dessert spreads around, Ginger does well in ensuring variety—from its tarts, cakes, kuehs to sweet soups. The strawberry tart comes highly recommended but the real crowd-pleaser is their coconut cake. Sandwiched between each layer of chiffon cake is fresh, tender coconut meat. For all the coconut lovers out there, this is something you definitely need to try. ‘A Clawsome Seafood on Grill’ is happening from 01 April to 30 June 2018. 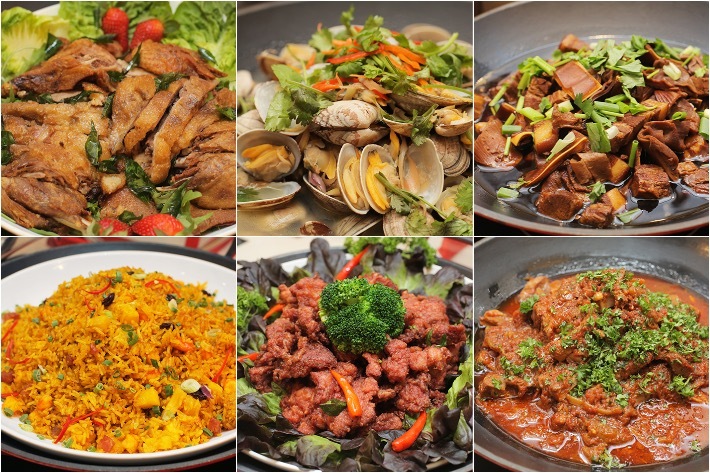 Don’t forget to quote ‘ladyironchef’ to enjoy 25% off for both the Weekend lunch and Daily dinner buffets. 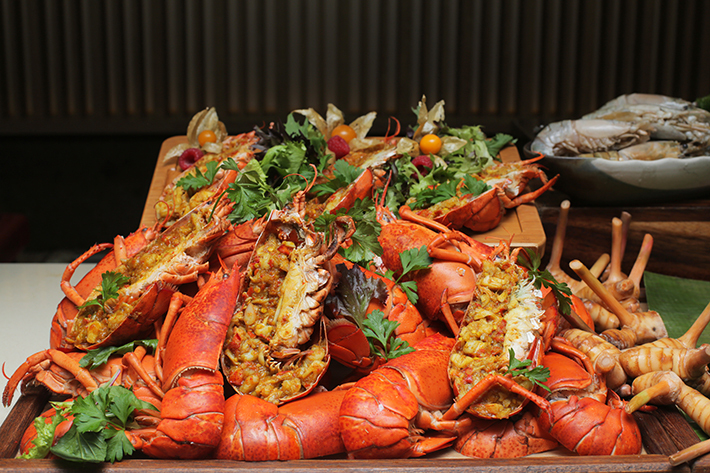 That means you get to enjoy an unlimited amount of crab and lobster delights at only S$51++ per adult for both the Weekend lunch and Daily dinner buffets! **Valid only for Dinner Buffets (Monday to Sunday). **Valid for Weekend Buffet Lunches (Saturday and Sunday). **Not valid on any special occasions, the eve of public holidays or on public holidays. **Blackout and closed-out dates do apply. **Not valid with any credit card discounts and promotions or any on-going promotions. **Reservations are required and subject to availability. **The hotel reserves the right to amend the promotional details without prior notice. **The hotel reserves the right to change its seasonal items without prior notice. **Price stated is subject to service charge and Goods and Services Tax (GST). Sorry where do i quote ” Ironladychef ” at to get 25% discount. Please advise. Hello, May i know where do i quote at for e 25% discount? Hi, how do I make reservation for Ginger’s BBQ seafood 1 for 1? Is the promotion still vslid and how do quote Ironchef for the 25% discount?